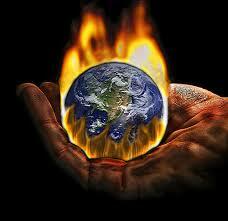 Global Warming – Clear & Present Danger! Creative energies create quite creative destructive arms & ammunitions! Alarmed by number of deaths due to nuclear bombs, humanity took a break, and created other types of weapons of mass destructions! But the biggest weapon of mass destruction that mankind created unknowingly is global warming! It’s a true weapon of mass destruction and yet so elusive that there are still debates going on about its existence itself and its role for alarming weather changes across the globe! Yahudi, Moslem or Christian, weather does not make any distinction of religion, countries, races or monetary status. Not even survival of fittest. For changes will be so sudden, random and rampant that even the fittest of all will fall like leaves of a tree in autumn. These threats are clear present danger – no more a topic of an essay, debate or theory. Gone are those days. Now is the time of direct action. If human race has to survive and flourish on this planet, it has to live in harmony with nature. Humanity’s nature of ‘use and throw’ can not be tolerated on planetary level. The planet is the greatest gift from The One – it’s your true mother – unless this is understood, humanity will continue to explore and exhaust Earth’s resources – as if it’s their natural birth right! What is the solution? None of the solutions are in sight as no one really cared to find seriously. The elite very intelligently created confusion on whether such threat actually exists or not. Unless you consider a threat as dangerous, you are not going to act upon it to prevent it. So now as per current scenario and mindset of mankind, there lies no solution in sight. May be once the threat level rises to alarming levels, when the intensity and frequency of natural disasters reach unprecedented levels, and especially when friends and families of elites are washed out, there will be clarity in the minds of people, media, scientific community and the elites! At that time and only at that time, need of creative solutions will arise and humanity will start for searching answers in most unusual place – within! For all that is seen, heard, experienced outside, arises from within. And then humanity’s true integration with the ‘nature’ will begin for a new golden beginning where mother Earth will be given due respect and life will be designed around principles and laws of nature i.e. co-existence of all – progress of all – compassion for all – for All That Is is One!